Hanover House is bite-sized--it's a novella after all. But in some ways, it felt a little bit too bite-sized, if you know what I mean. Actually, even I don't really know what I mean. I guess what I'm trying to say is, while the novella was enjoyable, at the same time, the open-ended-ness of it felt a little too open-ended. I get that it's a prequel, meant to jump start a whole new series with a bit of a bang, but there are ways of NOT making a prequel feel like it's still missing something. 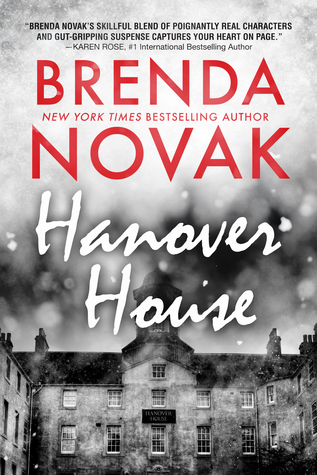 Nonetheless, Hanover House encompasses the suspense and thrill of a typical Brenda Novak novel. But I have to say, the writing style and pacing felt slightly different from what I remember of Brenda Novak. I'm tempted to use the word awkward, but at the same time, the events of this novella flew by quite quickly, maybe too quickly for me to be able to really point out what about it didn't really work for me. The progression just didn't feel as smooth or hooking as what I usually associate with Brenda Novak. All things considered, Hanover House serves it's purpose as the starting point for Evelyn Talbot's journey into studying the evil of killers as well as trying to evade the monster who's been haunting her life for the past twenty years. It's got a nice thrill of excitement, but not nearly to the point I'd been expecting. And unfortunately, you don't really get to see enough of the characters (not even our resident evil killer, Jasper) to really get to know them--and thus, I've yet to really form an opinion of anyone in the book. Not Evelyn and not Amarok, and especially not any of the side characters who have an air of potential significance, probably in books to come. And I'm not entirely certain I understand what that ominous letter at the very end symbolized, but I have a feeling it was supposed to be significant somehow. All in all, Hanover House was entertaining and enjoyable, even if not what I'd been expecting based on the summary and all the positive reviews. Maybe I'm just too picky? This was actually the only thing I have ever read by Brenda Novak and I really enjoyed it. I am waiting to see where it goes in the actual first book of the series. Still totally get what you are saying about it. Great review!! I've read two different Brenda Novak series. They weren't the best of romantic suspense that I've read, but they were definitely page-turners wherein you can't seem to stop reading until you hit the end. This one seemed a little different, style-wise. But I'm still looking forward to see how the first book goes as well. I always wonder when you get a prequel and it is very rushed like maybe it would have been better as a full book or with the 1st book instead. Great review! I feel like this one could have been better as a full book. But either way, I'm curious to see where the first book will take us. I have that issue sometimes with novella's as well, I think they can be written well as I've read some novella's that didn't have the issue. But sometimes a short story just feels too short or rushed. It does sound like the novella sorta sets the stage for the first book, so hopefully that one will be better.